Stained glass is our forte. 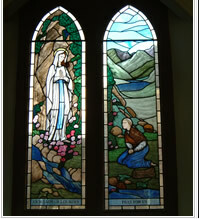 We make new stained glass windows for churches all over the country. Some of the windows are memorial windows and others are simply a celebration of faith. Have a look at some of the photos of The Glass House work and see how the design and creation process works. The Glass House also undertakes the restoration and conservation of antique stained glass. Click Here - to here to learn more about the stained glass window process.